Room was decent sized. Public transit into the city center was pretty convenient. 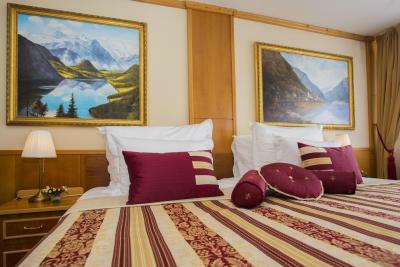 The room was well furnished and ventillated with a huge double bed + a child bed. It was clean and ready before our arrival. The house keeping staff did not let a chance to question / complain though the hotel was totally booked out. 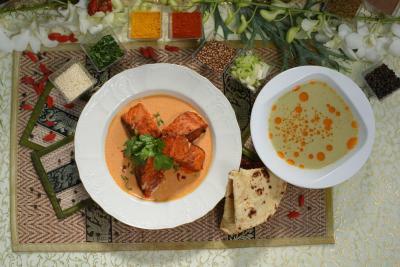 The hotel has a Indian Restaurant with good food quality ambience and a very friendly service offered. Breakfast was great. Location was great. 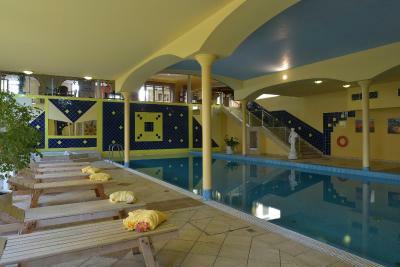 Family friendly but pool wasn't made for any kids or anyone under 5ft. Value for money is excellent. Room was unbelievable big and spacious. Overall above average. My experience was terrible. The hotel is so big, and because of this, the quality is zero. 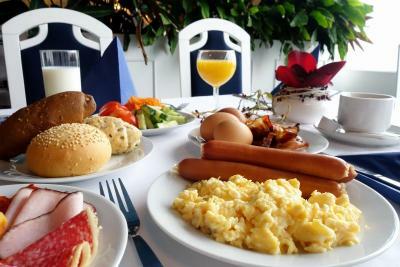 The breakfast was terrible.. was not even good to look at.. 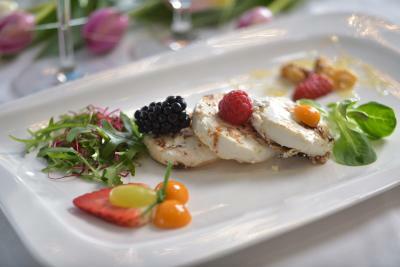 Quantity should not always compromise quality. I always came back to a dirty room. It's bad enough that they do not change the bed sheets until you force them to (I had to force them to change it.. and they did this only one time in my 11 nights stay!, but they don't even make an attempt to straighten out the sheets. You come back to a crumpled and not properly made bed. I feels better to sleep on your own bed than the hotel bed. 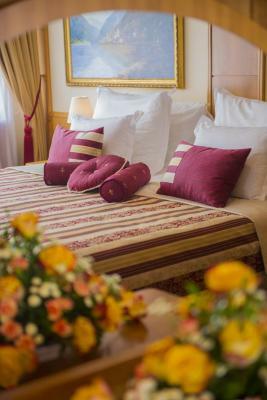 I usually look forward to the clean and crisp sheets of a hotel.. the feeling of sleeping on a professionally made bed everyday.. but at Top Hotel.. I couldn't wait to be home.. Food was zero, room was very big but the bed was zero... The hotel should pay more attention to it's house cleaning. that's the touch point to customers.. 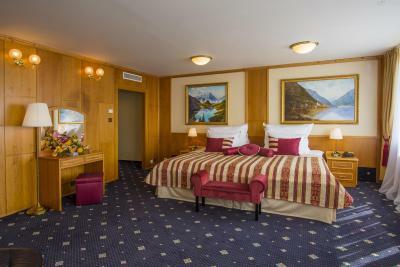 Very nice room in an grand hotel style. Definitely a place if you want to find something more than just an accommodation. Nice and clean place to stay. My daughters enjoyed swimming pool. The breakfast was OK, but that is really the only positive thing I can think of. 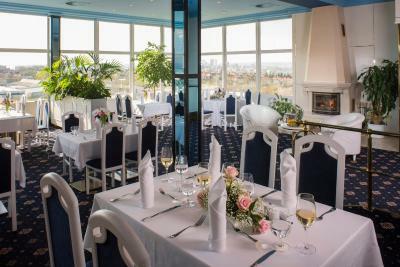 TOP HOTEL Praha This rating is a reflection of how the property compares to the industry standard when it comes to price, facilities and services available. It's based on a self-evaluation by the property. Use this rating to help choose your stay! 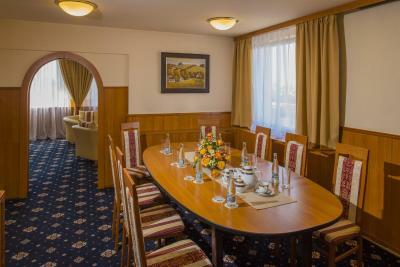 TOP HOTEL Praha is easily accessible from the highway 1 and 2,650 feet from the Chodov Shopping Center. 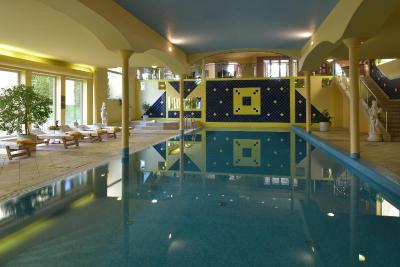 It offers an indoor pool, a hot tub, a solarium, a gym, bowling, several tennis courts and 2 receptions. 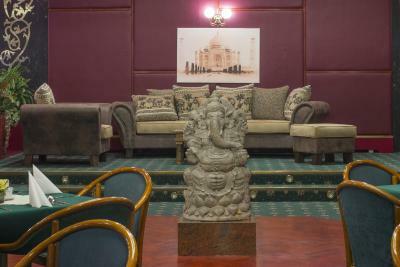 Free WiFi is available in the lobby as well as the rooms. 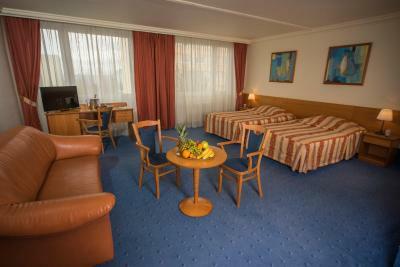 You can reach the city center by public transport within 25 minutes from the TOP HOTEL Praha. The bus stop is located right in front of the building. 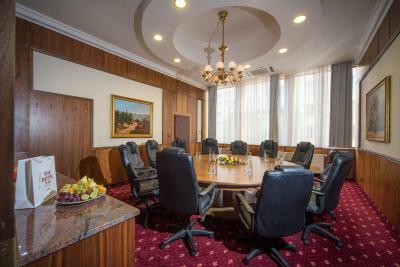 The rooms are provided with Smart TV with satellite channels and free WiFi. 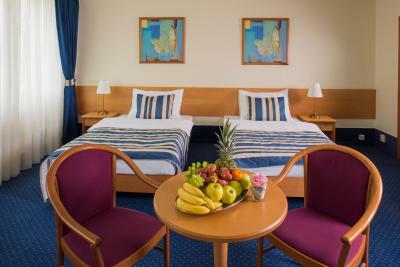 Some of the rooms are also air conditioned. 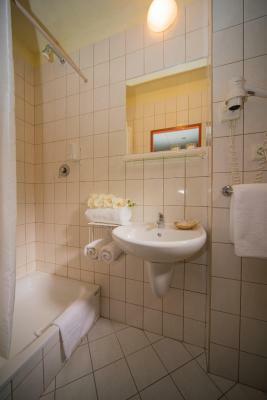 Rooms for disabled guests are also available. 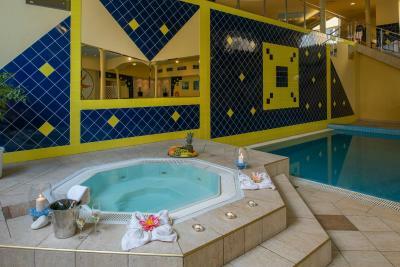 Wellness and sports facilities include a gym, indoor and outdoor tennis courts, a steam bath and an indoor pool and are available against a surcharge. 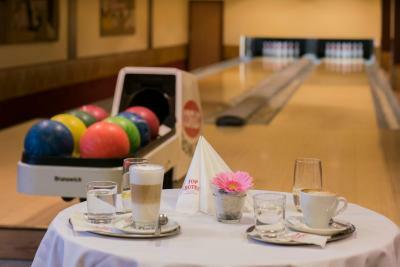 The bowling alley at TOP HOTEL Praha is open until midnight. Thai massages are also available. 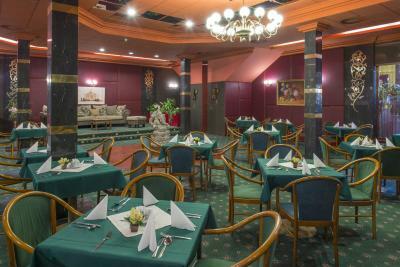 You can choose from 5 restaurants serving Czech, Indian and international cuisine, 3 bars, a lobby bar with a winter garden and outdoor seating area . 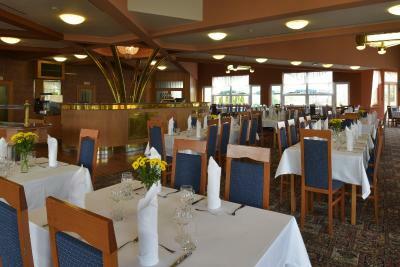 Refreshments are available in the lobby bar. 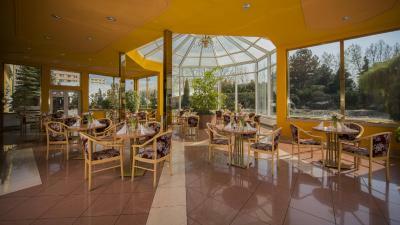 The hotel features a winter garden which has access to Japanese garden. 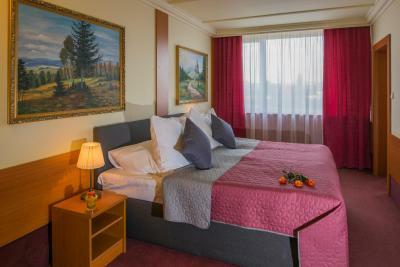 When would you like to stay at TOP HOTEL Praha? 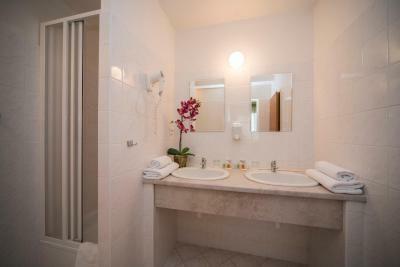 This room features satellite TV and a mini-bar, and consists of a private bathroom with a shower. Free WiFi in every room and in public areas. Public parking is available on site (reservation is not needed) and costs EUR 6 per day. 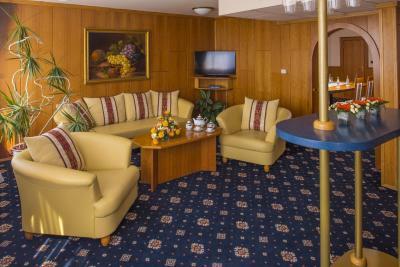 This spacious room with a seating area features satellite TV, a safety deposit box and a mini-bar, and consists of a private bathroom with a bath tub. Most units are air-conditioned. 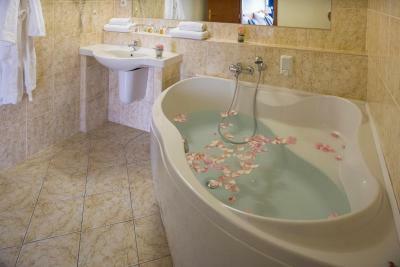 This room includes free entry to wellness. 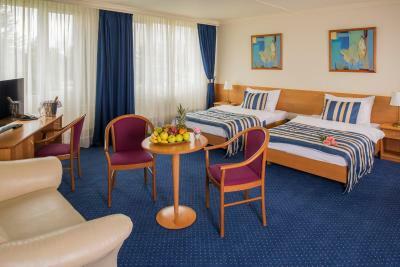 This twin/double room features air conditioning, mini-bar and seating area. 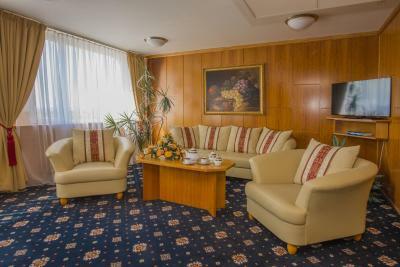 This twin/double room has a sofa, seating area and satellite TV. 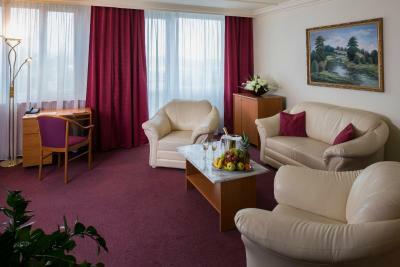 Presidential suite has an individually controlled air-conditioning and a high-speed LAN Internet, as well as free WiFi. There is a bedroom, living room, conference lounge, kitchen and a bar, cloakroom, desk, 1 bathroom with a shower and 1 bathroom with a whirlpool tub. 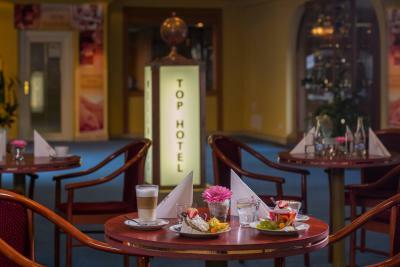 TOP HOTEL Prague**** an art hotel and one of the largest congress hotel in Europe! 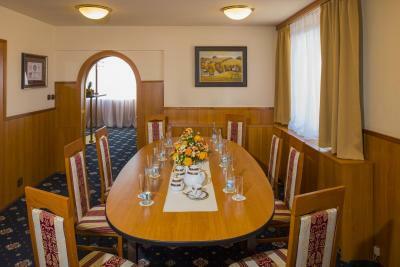 The luxury hotel premises will enchant you with masterpieces of Czech artists. 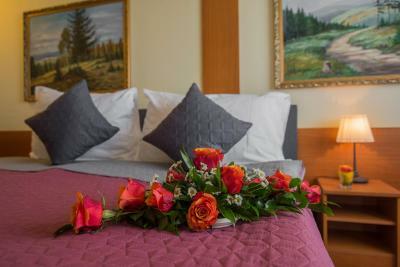 House Rules TOP HOTEL Praha takes special requests – add in the next step! 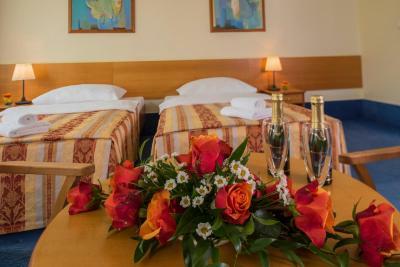 TOP HOTEL Praha accepts these cards and reserves the right to temporarily hold an amount prior to arrival. Staff should know more about buses, trams and such. Complementary water wasn't even given. Not enough lights in the room. Good connectivity to public transport. OMG worst mattress ever!!! I think it's about the time to think get new one. 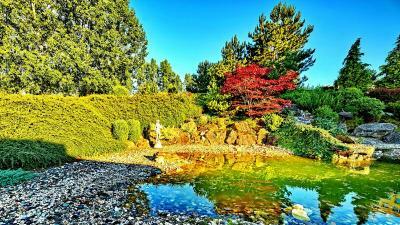 Some of the significant features like the Japanese garden were non-functional.. 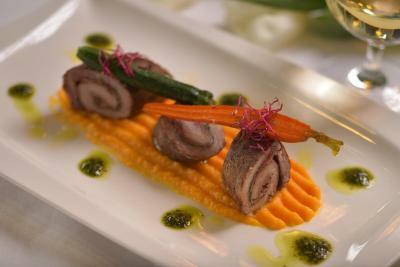 Restaurant staff could smile and be warm to guests.. The cakes could have been fresh on certain days..
A room and a hallway were too dark. Very big and clean room. It is certainly not TOP hotel, more like BOTTOM hotel. 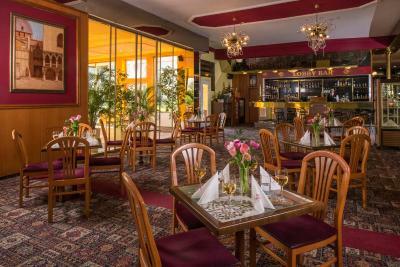 The whole hotel looks like the setting of the Congress of the Communist Party in 1986. Our room was huge, but almost completely empty, save for 2 beds and 2 chairs. The shower had two settings: off and searing hot. The staff is rude and unfriendly, very slow, and they keep forgeting parts of the order (but they will not forget to charge you for it!). Also, speaking english is not their strong suit. Room: even if they know about the arrival of three people, the beds were two; patched sheets, and beds never redone for 4 days. Old and partly broken furniture (eg desk). 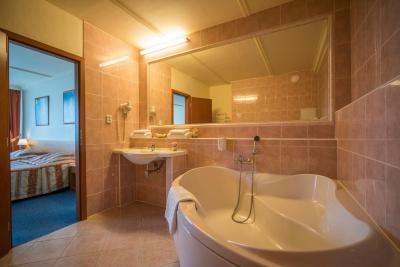 Bathroom: in 4 days we were never able to have adequate towels, only 2 face on arrival, the next day only a shower, never a carpet for the shower, sanitary ware and bathroom floor never cleaned for 4 days, just adding toilet paper . Air conditioning: the excessive heat is over 30 °C (not manageable from the room) have made the night away tiring. Structure: restaurants frequented were not welcoming, with dirty tablecloths. 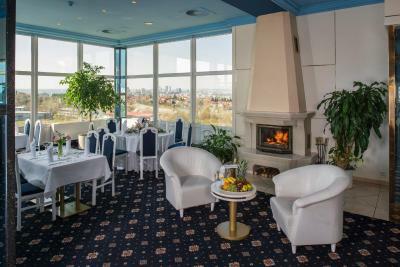 Breakfast: at the Bohemian Restaurant with windows and views on the popular district. The offer from day to day decreased in terms of quality and quantity. The room: adequately large for three people. 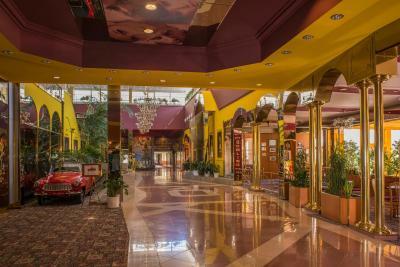 The large and well decorated lobby. 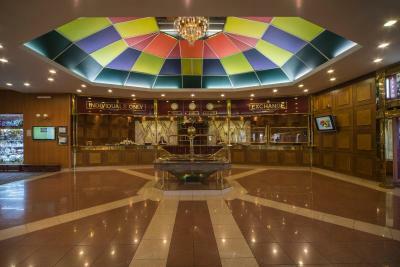 the restaurant with stained glass windows. Way outside the center. Staff at the best indifferent. All of the facilities had to be paid for. No kettle in room. Food was poor. Poor lighting in room and timed lights in hallways that were not sensored. Most restaurants closed. Staff unhelpful. Shower was handheld. Could not stand up for shower as no mat present. Location. Near massive shopping center. Easy access to city center.